Every Seahawks fan has seen the dramatic difference in how the team has played lately. This short series will visually highlight areas where the change has been most pronounced. 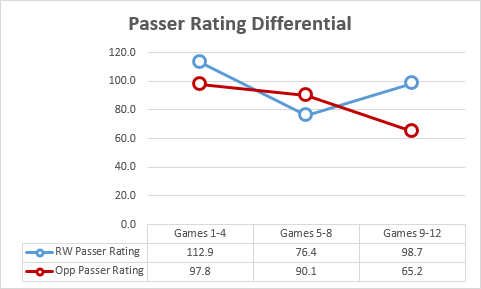 Many of you know that passer rating differential is one of the best predictors of Super Bowl champions of all the metrics out there. It is important enough that I use it as a large factor in my weekly power rankings. Seattle led the NFL in this category last year, but has struggled here much of the year with a negative differential. Not anymore. The Seahawks started the season playing Aaron Rodgers, Philip Rivers, Peyton Manning and Kirk Cousins. Believe it or not, Cousins and Rivers had the best performances of the group. It is worth pointing that out because too many attribute the early struggles in opponent passer rating to the level of competition. Cousins eclipsed 100.0 in passer rating against Seattle and is playing behind Colt McCoy now. Things did not get that much better in the next quarter of the season even though the team had three games against Austin Davis, Cam Newton and Derek Carr. Davis registered the highest rating (132.2) of any quarterback against the Seahawks this year. Again, this was not about level of competition. The Seahawks legendary secondary and pass rush of 2013 allowed a league-best 65.4 opponent passer rating. The team has allowed 65.2 to the last four quarterbacks, and four of the last six quarterbacks have failed to reach a 67.0 rating. 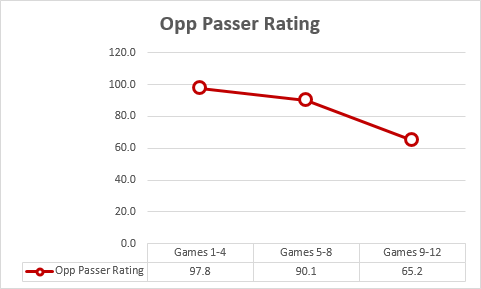 Seattle is back to impacting quarterbacks in a way similar to what they did last season. They are doing it with new secondary members. I do not think it is a coincidence that the Seahawks stretch of good pass defense started when Tharold Simon joined the team. Jeremy Lane is not a strong factor, as he has only played two games (NYG, ARZ) in the secondary. 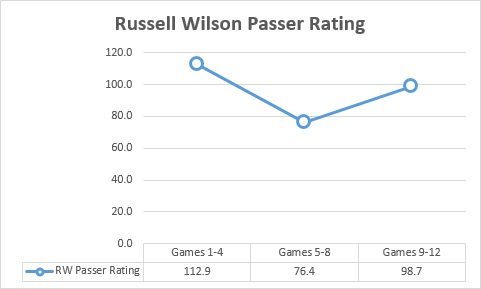 Russell Wilson had a rating of 100.0 or greater in each of his first two seasons. He started off incredibly strong, from an efficiency perspective, but struggled a lot in the second quarter of the season. He has recovered over the last three games. That 98.7 rating over the last four games includes a 53.7 stinker versus the Giants. He is at 110.9 over his last three games, and 120.2 over his last two. He is doing it with increased efficiency across the board, from completion percentage to yards per attempt to throwing more touchdowns and fewer interceptions. The Seahawks cumulative passer rating differential was negative as recently as three weeks ago. This current run has them firmly in positive territory. The spread over the last four games (+33.5) has approached where they ended last season (+36.6) and is near the NFL leader this year, Green Bay (+35.3). Seattle faces Mark Sanchez, Colin Kaepernick, Drew Stanton and Shaun Hill to finish the season. There is good reason to think they can continue their strong run of pass defense. The Eagles also rank 19th in the NFL in allowing an average of a 90.4 passer rating, and Wilson has already proven he can have success passing against the Rams, Cardinals and 49ers, so the passing efficiency on offense could continue as well.